Can You Slim Down Muscle? Muscle is the most adaptable tissue within your body, responding to resistance training by increasing in size, according to the University of New Mexico. When you perform strength training, your muscle fibers undergo trauma. As your cells work to repair the damaged tissues, new muscle protein strands interlink to create a larger surface area, resulting in larger muscles. If you’re not happy with the size of your muscles, it’s possible to slim down by decreasing resistance-training weights. If the problem is overall size, you can slim down and create a smoother muscle appearance by reducing body fat. Athletes sometimes see supersize muscles because of the types of activities performed, according to Columbia University Health. Performing a small number of repetitions of very heavy loads can create bulky muscles; so can performing “explosive” movements, such as sprinting. Focusing on one part of the body for strength training can also result in muscles that seem bulkier than other parts of the body. One option for slimming down muscle mass includes making changes in your weight-lifting regimen. For example, Columbia University Health states that you can cut back on lifting heavy weights during strength training. Instead of performing one to four sets of lifts at three to five repetitions each, using very heavy weights, adopt a more moderate approach. That might include three to five sets of lifts at 15 to 20 repetitions each. Additionally, include distance running or other endurance exercises to slim down bigger muscles and achieve a leaner muscle profile. Running five to 10 miles could help you slim down leg muscles, for example. Highly trained endurance athletes tend to have leaner muscle builds, according to the "American Journal of Physiology." 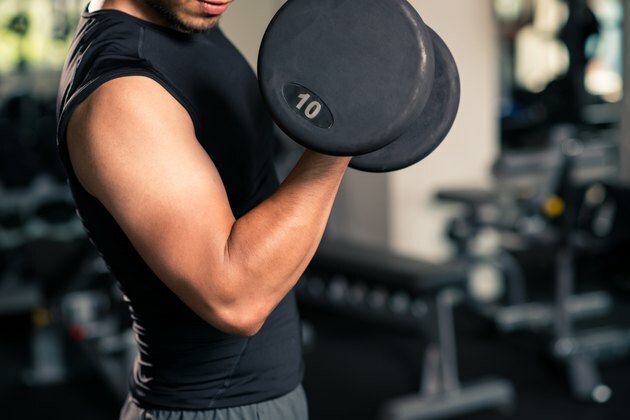 Although you might want to slim down muscle for aesthetic reasons, this can negatively impact your athletic performance, according to Columbia University Health. Smaller leg muscles will reduce your athletic ability in sports such as soccer and football, for example. You might consider changing the way you think about your larger muscle size rather than changing the size of your muscles. It could be that your muscles appear bulky because of body fat making you look bigger. If you’d like to retain your muscle shape and size but achieve a slimmer look, burn through extra calories and fat for a leaner overall profile. ACE Fitness recommends creating a calorie deficit of 500 calories per day in order to lose one pound per week. Lower-intensity exercises use a larger percentage of body fat as fuel to get the job done; however, higher-intensity exercises help keep your metabolism boosted postworkout, resulting in a greater calorie deficit. Either way, extra cardio will help you burn through extra calories and fat, which could make your muscles appear less bulky. University of New Mexico: How Do Muscles Grow? Columbia University Health: How Do I Slim Down Bulky, Muscular Thighs? Will Running Slim Muscular Legs? How Long to Notice Muscle Gain? Does the StairMaster Make Your Legs Bulky?